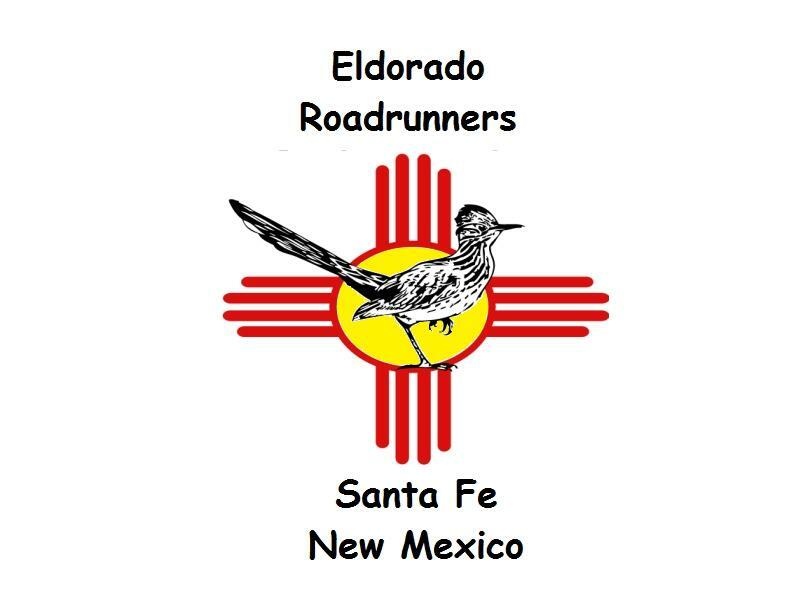 The Eldorado Roadrunners is a group of RV enthusiasts based in the community of Eldorado, southeast of Santa Fe, New Mexico. Membership is not limited to Eldorado residences. The meetings are scheduled the third Tuesday of each month. The date and location of the monthly meetings are at local restaurants or a member's homes. . Meetings usually begin at 6:00 p.m. and are usually preceded by a meals and warm fellowship. Club trips are planned around interesting and fun locations in New Mexico or areas in Texas, Colorado, or Arizona that are close to the New Mexico borders. Locations are selected for their amenities, interesting activities, and proximity. Our members enjoy fishing, golf, hiking, good food and drink, with a healthy sprinkling of comradery. Eldorado Roadrunners participate in several fund raising events each year for charities. Twice a year, the club is involved in community improvement activities. We invite anyone who enjoys RVing to join our group. Yearly family membership is $10 per year. For more details, contact Brad or Beverly at (505) 466-4655.